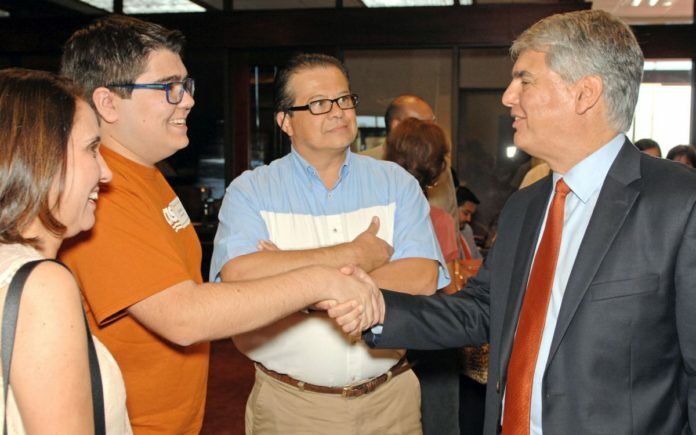 Carlos Cisneros, a Veterans Memorial Early College High School graduate, shakes the hand of the University of Texas at Austin President Gregory L. Fenves as Cisneros' parents look on Wednesday evening during the annual UT-Austin Student Send-Off Celebration at IBC Main Branch in Brownsville. Speaking in Brownsville on Wednesday, UT-Austin President Gregory Fenves reaffirmed UT’s commitment to diversity in reference to a recent inquiry by the Trump administration into the discrimination of white students. Reporting by The Associated Press and staff writer Frank Garza.